There are many products that can be printed and customized. We try to offer a wide variety of options so you can look your best at the next event. Please see some products that you may find useful. Select your product and get a FREE visual mock-up. Fitted printed table cover or custom throws. We have them both. Our table covers fit on any standard 6ft or 8ft folding tables. 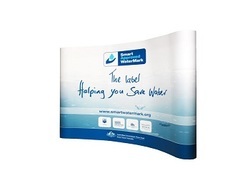 Printed back-drop pop-up walls are easy to set up and give you a professional look. We have 10'x10' or 10'x15'. Straight or curved. Printed curb signs are essential for any retail or restaurant. Draw potential customers to your business with custom printed curb signs.